Pneumadyne’s polypropylene 5-station pneumatic manifolds are a handy solution for supplying multiple lines from one input source. These manifolds have an operating pressure of 0-150 psi and are recommended for use with air or water. 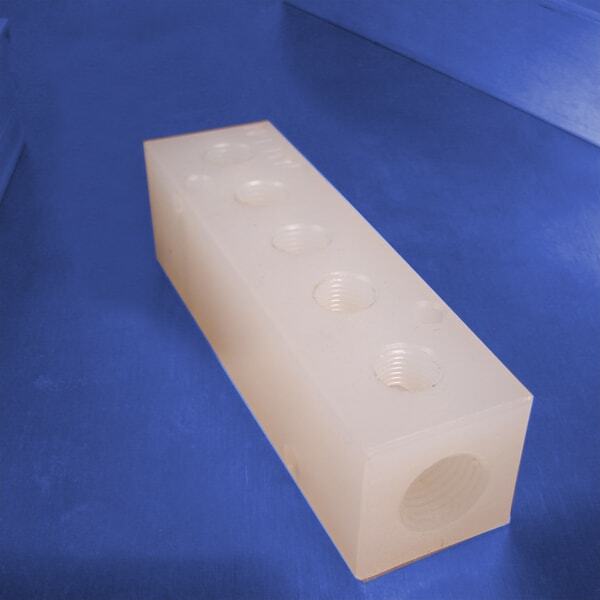 Precision machined from durable natural (white) polypropylene, these pneumatic manifolds are available in two standard input sizes: 1/4 NPT (F) and 3/8 NPT (F). Threaded ports make connecting implements and supply lines fast and easy. Two sets of mounting holes provide installation versatility. Order 5-station polypropylene pneumatic manifolds for your application, or contact Pneumadyne to learn more.